There was a movie years ago called “Support Your Local Sheriff” and I’m sure that over the years there have been numerous “support your local band” slogans thrown around. Well, here’s our turn to hold that banner high. While gig going and seeing your heroes on stage is as fine a thrill as can be had there’s much to be said for having a local band that you can drop in on and depend on for a fine night of well played and well selected songs. Cover versions perhaps but played with dexterity and a finely honed sense of homage to the masters. Best heard in a bar, an indulgence for the band (who probably all have day jobs) and for the audience (for whom beers will flow) but ultimately all part of the musical mindscape that folk who read blogs like this inhabit. 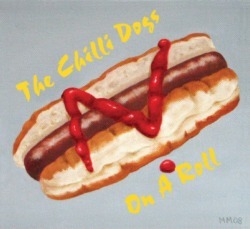 The Chilli Dogs are one such conglomeration. They dwell on the classic Americana songbook (folk, blues, jazz, country, singer songwriter, L.A. canyon rock and all points between) and can usually be seen and heard in the folk and drinking dens of Edinburgh. Back in the days they would be so local as to be only available to local folk but due to the wonders of digital recording they’ve unveiled an album that shamelessly exposes them to the wider world, to their credit they avoid blushes and display their wares with a flourish. Recorded in a living room the album features ten Chilli Dogs in various permutations on 15 songs written by artists as varied as Lowell George, Blind Blake, The Grateful Dead, John Prine and Sonny Boy Williamson. The basic sound is acoustic, string based music although there is some fine electric guitar from Jonathon Hearn. Fiddles blaze, guitars resonate and slide, accordions wheeze and over all this lead vocals are swapped from song to song. In fact the varied menu does its best to approximate a gig set list so that one minute you’re in Louisiana Cajun country and the next grooving to a nasty Chicago blues groove. With the opportunity to flesh out the bones of their acoustic pub sets there are some fine touches such as the organ on Help Me and the revivalist tent sounds on The Old Purple Tin, a tremendous demon drink sound (originally by The Alabama 3). With the majority of the songs covered here familiar to anyone with a decent record collection The Chilli Dogs don’t claim to improve on the originals but there’s no denying the sense of fun and joy they’ve had recording this. Songs like Before I Grow too Old, a Fats Domino song but here using the Tommy McLain arrangement from the tremendous Charlie Gillet compilation Another Saturday Night, show that they know their stuff. The best is the closing arrangement of No More Cane on the Brazos where the whole ensemble join in the singing bringing a fine little album to a fine end. Kimmie Rhodes. Miracles On Christmas Day. So it’s that time of year again when cashpoints ring and Christmas music comes tumbling out of everywhere. Here at Blabber’n’Smoke we’re a little bit curmudgeonly when it comes to these seasonal offerings. With the exceptions of the granddaddy of all Christmas albums, Phil Spector’s a Christmas Gift To You and John Fahey’s The New Possibility there’s not a Christmas album that we’d really sit down and listen to. In fact with the vast majority of them we’d rather stuff our ears with stuffing and hunker down with the turkey and hope it all goes away. So here we have Texan singer and songwriter Kimmie Rhodes’ Miracles On Christmas Day. First thought on reading the bio and finding out that it was originally released in November 2010 and that it is re-released next week is either that this is cashing in or an astute awareness that this time last year most of us in the UK were snowbound. No matter, what does it sound like? Well, for a Christmas album it’s not half bad. Of the 12 songs nine of them are composed by Rhodes and she certainly captures that child like sense of Christmas wonderment so beloved of Hollywood and TV admen. Semi devotional and glistening with sparkling guitars and keyboard songs like the opening Miracles On Christmas Day and The Toymaker’s Hands drip with seasonal sentiment and as such wouldn’t really be listened to outwith the Christmas window. Indeed it does beg the question of what to do with a Christmas album as one is unlikely to grab one from the shelf mid summer and stick it on. However, as Christmas songs go these are immaculately played and Rhodes actually manages to fit in a few that veer away from the template. Wake Up Sleepy Town is a superb Tex-Mex ballad with Joel Guzman of Los Super Seven doing his best Flaco Jiminez impression. Her version of Patty Griffin’s Mary is given a powerful interpretation while her rendition of What Child Is This with wintry sound effects and set to the music of Greensleeves is very evocative. Listening to this reminds us that while many folk might never have known of the late Bert Jansch his version of Christina Rosseti’s In The Bleak Midwinter is now a staple of many family Christmases due to its inclusion on numerous Christmas compilations. So who would buy this? Kimmie Rhodes fans for sure. For anyone else that’s looking for some music to get into the spirit it does conjure up a Christmas feeling and it’s a million miles better than the usual retreads.